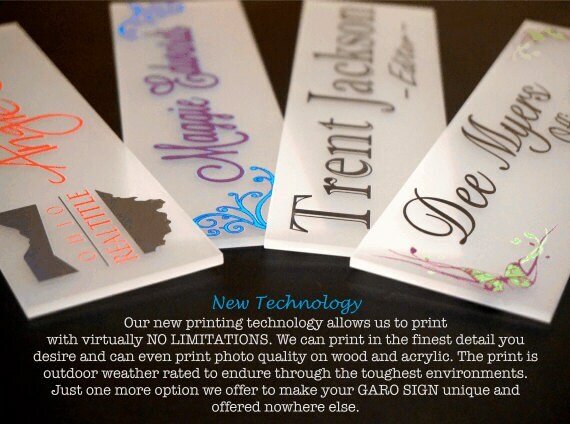 GARO SIGNS Unique Floral Desk Name Plates. Make sure to check our homepage for current SHIPPING DEADLINES during busy Holiday seasons! 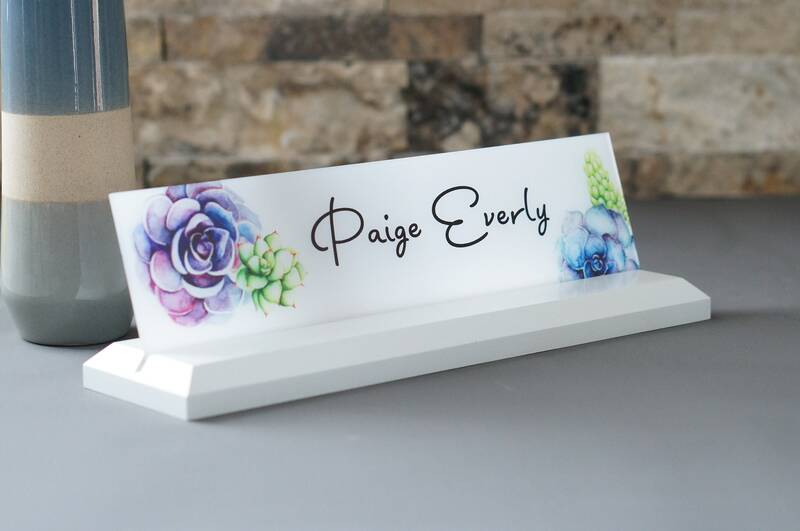 You may see other nameplates for sale online however no other nameplate can match our high end woods and superior durable finishes. YES! We also do LOGO's. We have a new digital printing technology that allows us to print with virtually no limitations. For an additional $6 just select the logo option during checkout and send us an email attaching your desired logo. Note: the floral decorations shown in this listing are not an extra charge. We look forward to working with you in creating the perfect office sign your co-workers will envy. 2. - At checkout there will be a box called "Leave a Note to Seller"
3. – We’ll work with you to create a proof and once approved we’ll create your sign and ship it right out! How long does it take to produce and ship my order? 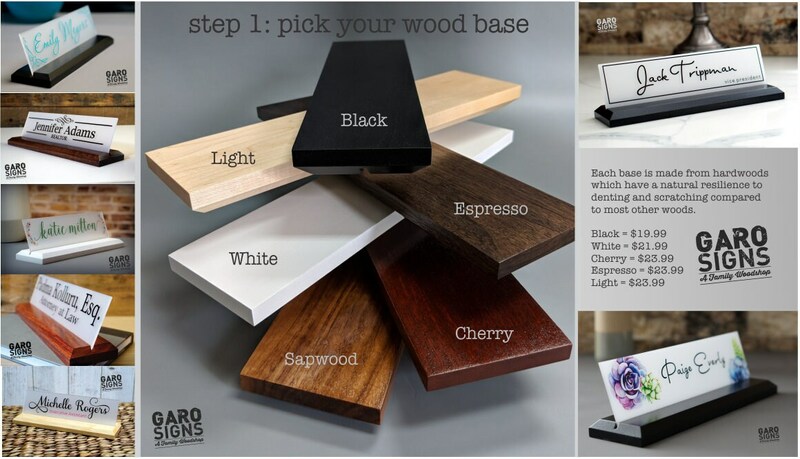 Here at GaroSigns we know you're excited to see your custom sign and we work diligently to ship your product quickly. Standard sized office signs have the fastest turnaround 4 - 7 business days. Bulk orders over 20 items are typically 10 - 14 business days. Family Name Signs 5 - 10 business days. Large custom business signs 14 - 21 business days. I made a mistake during checkout or just want to change the information for my order? We are certainly used to this by now. We have a quick internal process to fix your order if it's not too late. Just message us as soon as you can and we'll update your order notes. 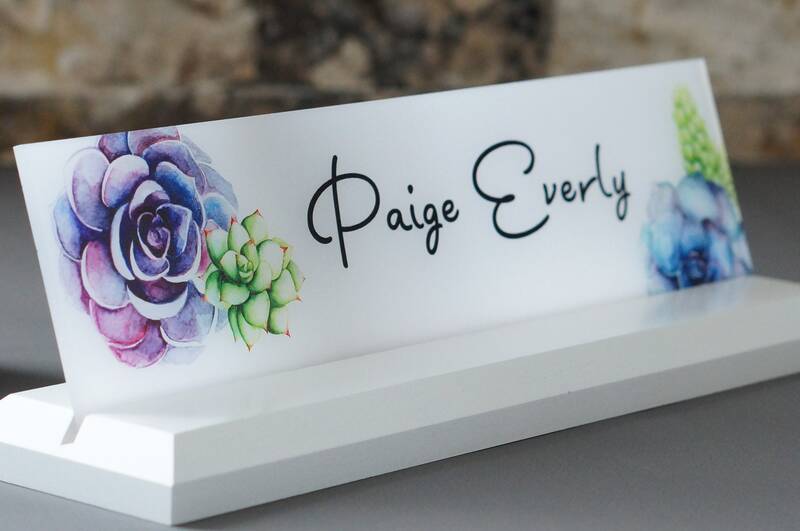 If your order has already been personalized then we can offer you a 50% off coupon code for a replacement sign if you'd like to make a change or fix the mistake. Do I get to see a proof before my order ships? Absolutely! For personalized signs (as most are) we always send a proof before your sign goes into production. We do ask that you first make an order and we'll send you a proof as we reach your order in the production line. 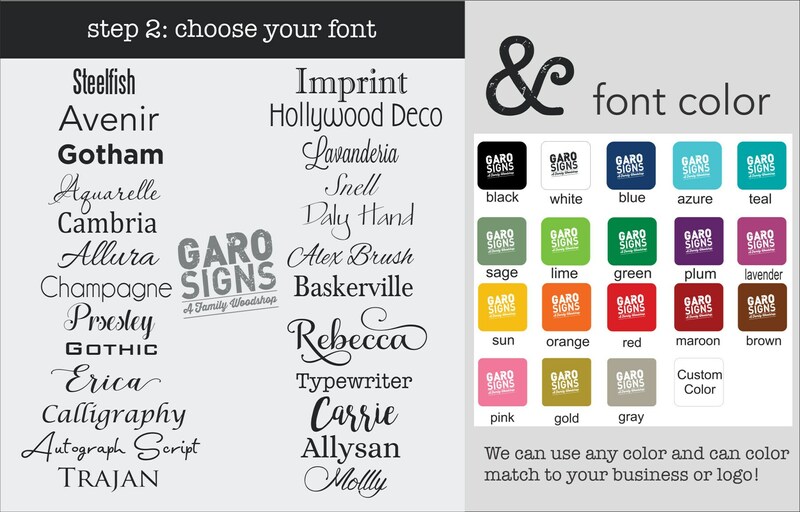 We ask that you be specific with your colors and fonts to help us save time as we have many signs to process every day. I gave you the wrong shipping address? Please contact us as soon as possible with the correct address and we'll update your order notes. My information has changed and I'd like to update my current office name plate? Not a problem! 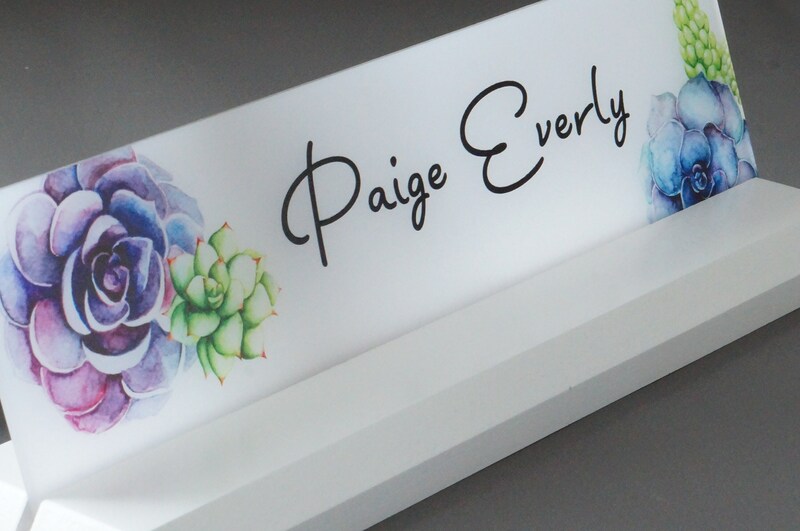 We designed our name plates with you in mind. 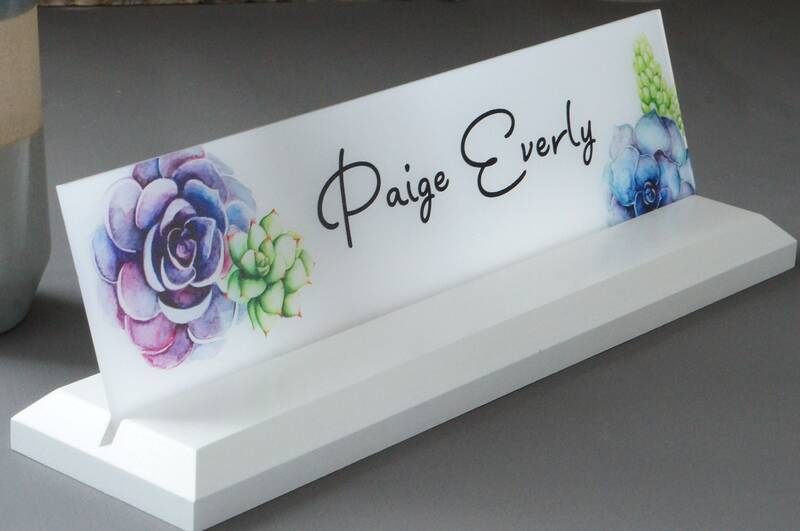 Simply purchase our "acrylic only" listing for half the price of the entire sign. If your sign was mounted with silver standoffs then they are easy to twist left and unscrew in order to mount the new piece. The acrylic seems crooked mounted to the wood sign? Also not a problem! If this applies then you purchased a business sign that is mounted with silver standoffs. Sometimes the acrylic can shift during shipping. Simply twist to the left and loosen the standoffs; re-center the acrylic and tighten away. How much longer does International Shipping take? We ask that you please refrain from using profanity or vulgar gestures. We do see this from time to time and are unable to accommodate expletive wording or pictures on our signs. It is beautiful. The fliers and the script are perfect. So pleased with the quality and whole transaction. Sellers were great as I really didn’t have a good idea of what I wanted. They helped me. Highly recommend them and I know I will be a return customer. Very pleased.